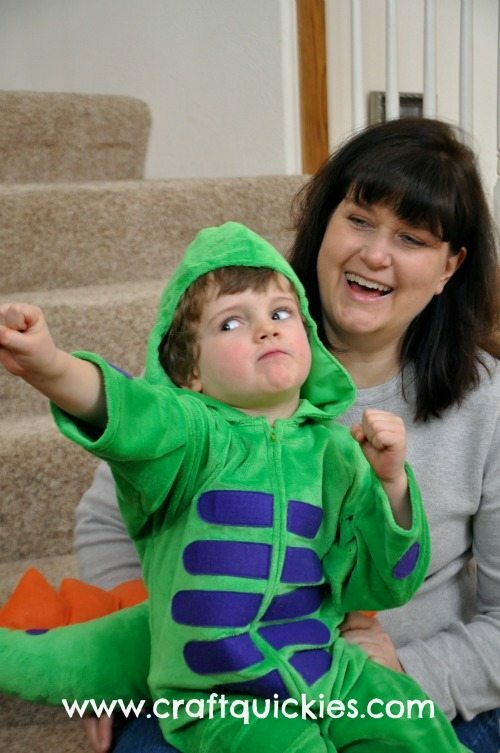 I knew that there was no way I could pull off two “Power Suits” in time for his birthday, so I asked my awesome mother-in-law to help me out with the Dragon Power Suit. She used Cuddle Fabric and it turned out amazingly! 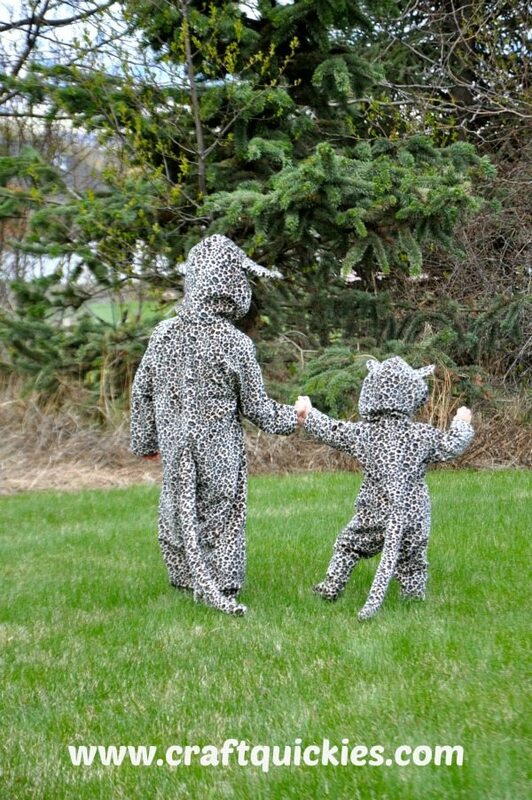 Well, as it turns out, I was so busy with party preparations that I never got around to making the Cheetah Power Suit. 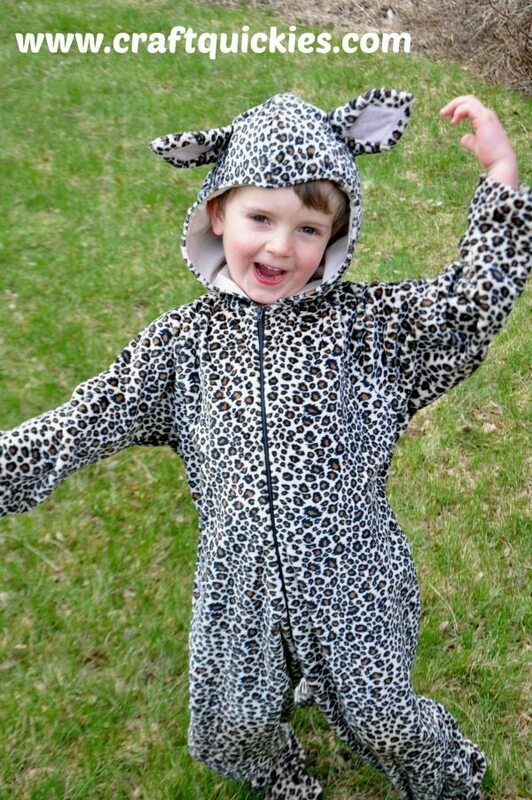 Luckily, Grandma had such a ball watching my rowdy boy play in his Dragon Power Suit for the ENTIRE weekend and refusing to take it off that she asked if she could make his Cheetah Power Suit as well. Ummm…..let me think about that for a second….YES, PLEASE!!!! She is a MASTER seamstress and I am self-taught with two years of very limited experience. I will hand off a sewing project to her any day of the week! So I ordered up a few yards of the unbelievably lush and snuggly Cuddle Jaguar fabric from Shannon Fabrics. 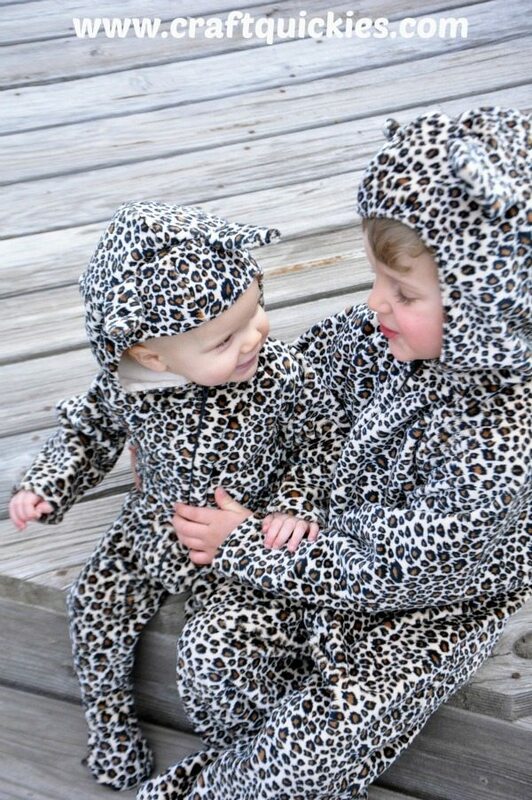 (There is a cheetah one, but I was taken with the larger spots the day that I ordered it.) And then Grandma got sewing, and someone was pretty darn pleased with the outcome! Silly goose. And then I left for three days for the SNAP Blogging Conference, and when I got back THIS had happened with the leftover fabric! Are you even kidding me?!?!?! I may die from the cuteness!! Want a few more details about the creation process? 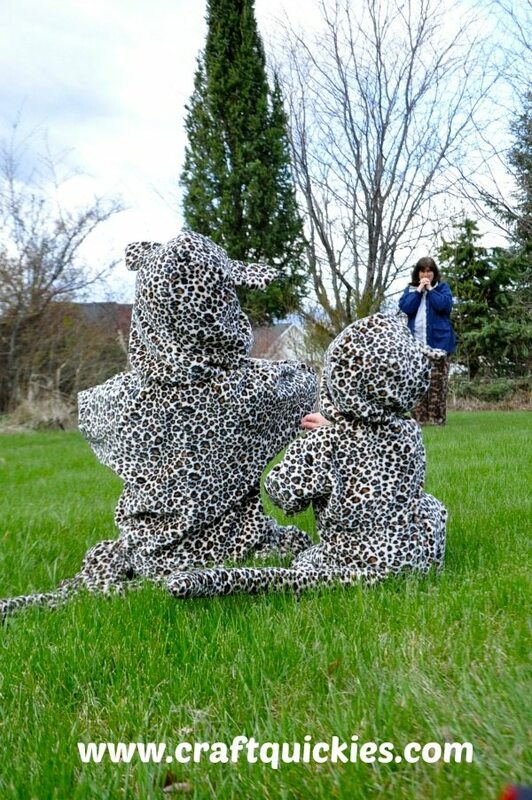 Well, as we have established, I didn’t sew these Cheetah Power Suits, and I wasn’t even there when she did, but she took a few pictures along the way for me, so I can give you a general idea of her work process. Luckily for you, she works from patterns. Before you start working with Shannon Cuddle fabrics (which is a specific, fabulous brand of minky fabric) you should keep a few things in mind. Cuddle fabric has some unique quirks, so be sure to check out these tips from the Shannon Fabrics website prior to diving into your project. Ok, now let’s get going! These are the patterns she combined/used for Callum’s Cheetah Power Suit. For Jade’s suit she used an old pattern she has had since she was sewing sleepers for my husband when he was an infant. You could find any baby sleeper pattern for it. She is a pattern follower for sure, but she did adapt it a bit at my request so that the headpiece would be an attached hood and to close up the feet like footie pajamas, even for Callum’s outfit. There is nothing I hate more then dealing with a meltdown because Callum can’t find the one last piece of a costume he wants to wear. Ay ay ay! I wanted them as one solid piece, and she was kind enough to humor me. This little wolf (wearing a Where the Wild Things Are outfit I made him for his third birthday) was very excited about the process, so he supervised Grandma and (the very pregnant!) Aunt Taren’s progress. Below you can see how she made the hood, made the ears, then slit the fabric, slid in and pinned the ears, and then sewed them firmly to the hood. At that point she added in a lining and attached the hood to the body. She has skills that I do not have. Below you can see her process for making the feet. I thought it was very clever how she zig zagged the elastic into the ankle for a more snug fit which leads to less tripping. 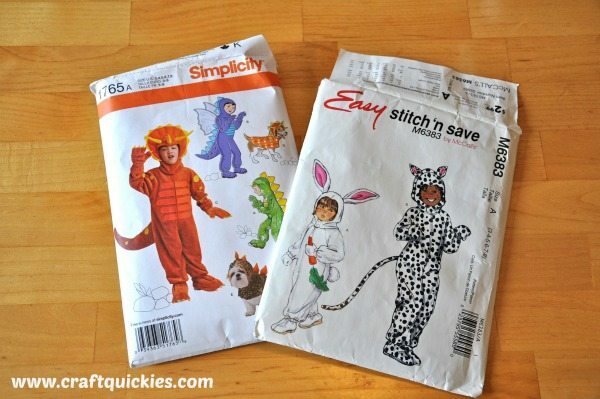 The final modification that she added to the patterns was to sew a zipper in along the inner leg seam (aka the crotch) of the baby costume. That was I can unzip it for quick and easy diaper changes without having to pull her halfway out of it or exposing her little baby chest and belly. BRILLIANT! Apparently she has been doing that to baby sleepers since she made them for my husband and sister-in-laws as infants. Now let’s just admire the finished product in action, shall we?! 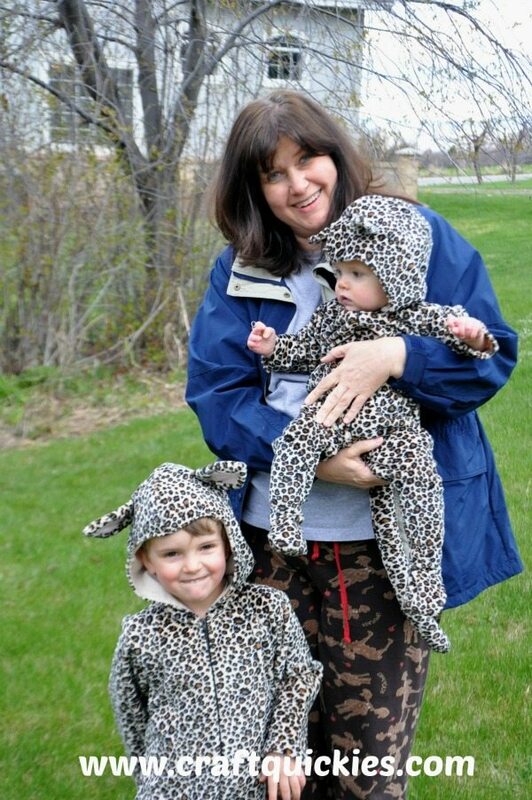 I love my little cheetahs, and I love how much they love each other, as well as their awesome grandma! You guys, I honestly can not say enough great things about this fabric. As you can tell, it has gotten a LOT of wear and tear. Inside, outside, worn as PJs, worn while eating, worn while playing, worn at the STORE a few times. I kid you not. If you want proof that my son never removes this thing then just check out my Instagram feed. He is OBSESSED. He won’t even take it off in 88 degree weather when he is playing outside. And he is a sweaty, sweaty boy. But despite all of the sweat, dirt, water, and food that has assaulted these cheetah suits, each time they come out of the dryer looking amazing. Aside from the fabric directly under his feet, the suit still looks BRAND NEW!!! It is rather remarkable, really. I think that this fabric would make the PERFECT Halloween fabric!!! It looks amazing and it is warm enough for trick-or-treating! 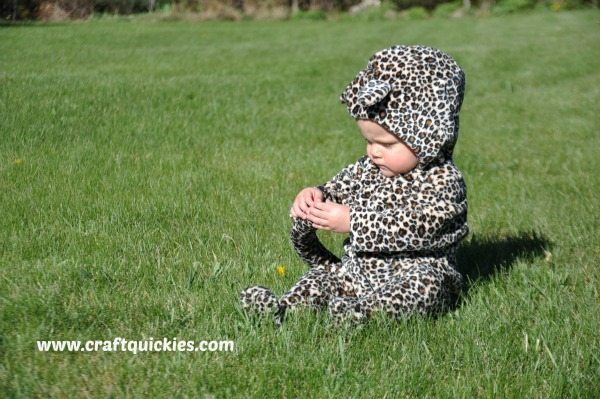 And, luckily, Shannon Fabrics has this fabric available in all of the following animal varieties: giraffe, cheetah, jaguar, zebra, dalmation, cow, pony, leopard, and tiger. SCORE, right? You can find all of their animal fabrics here. So thank you, Shannon Fabrics, and THANK YOU GRANDMA!! Oh my gosh these are so stinking adorable!! And how soft and comfy too! Love them. These are adorable! The best part is that fabric looks so warm and comfy. Here in WI it is pretty cold come trick-or-treat time so a warm costume is a must! And comfy is equally important, because who wants to hear a kid complain house after house? Not I! Oh my gosh, so cute!! The fabric is adorable!! That fabric looks luscious to the touch! And the little cheetahs themselves are scrumptious! It IS luscious to the touch! And they ARE scrumptious!!! So adorable – and you KNOW I went ahead and bookmarked that Tips page. I wish I had that last Halloween! I’ve never seen cuter fabric! 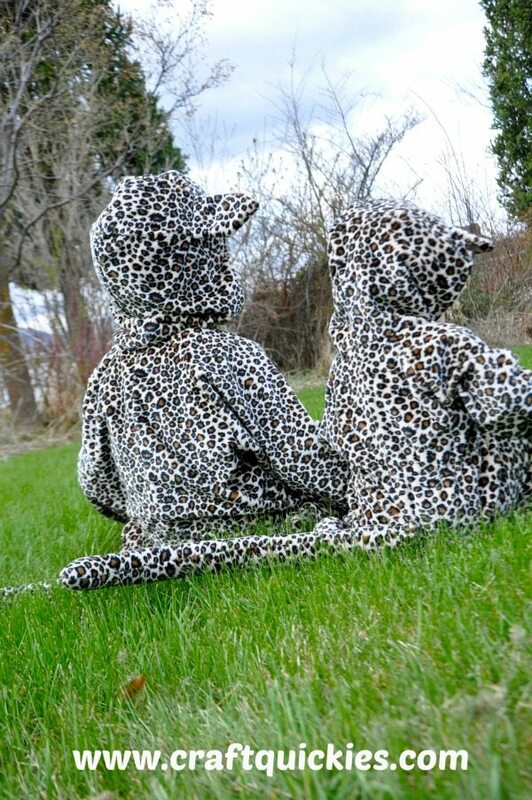 We’re huge into dress up at our house, mama might have to give this project a whirl! Thanks for posting such detailed pictures. Novice sewers like me always need a little extra help! These are adorable!!! No wonder your mother-in-law volunteers to sew for them! I’m in love!!! Ack, I think I just died from all the cuteness! My kids would love these. Definitely going to keep that fabric store in mind! too stinkin’ cute! now if only i had someone to sew for ME! that fabric looks amazing. These are insane… I need a gifted seamstress mother in law! Oscar would love one of these. The matching cutness is out of hand. Oh my goodness those costumes are too much! Love the quality and how they turned out! So adorable! I wish I had a mother in law like that! cute cute. These are SO adorable!! My daughter would love one of these…she totally loves to play dress up! these are DARLING!!! LOVE LOVE LOVE LOVE LOVE!! These are too cute! And that fabric looks amazing! OMG – so cute. I love your little girl – I want to take her home! She’s a sweetie! Adorable!!! my boys would LOVE those!!! How fun! These are the cutest things ever!